Wijmo's input controls are designed to make data entry easy and efficient, using mouse or touch. Specialized and optimized for each data type, Wijmo's variety of input controls answer every application need. The ComboBox control is one of the most powerful and flexible in Wijmo's input module. It can be used to edit strings and to select items from lists. It is used as a base class for several other controls including AutoComplete, MultiSelect, InputTime, and Menu. ComboBox also includes grouping for extra-long hierarchical lists. input element (exposed by the inputElement property): An HTML input element used to display and edit the current value. In a few cases, this element may be replaced with a non-editable element (e.g. Menu and MultiSelect controls). 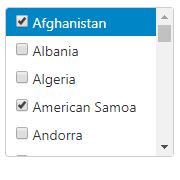 drop-down button: A button used to show or hide the drop-down element. 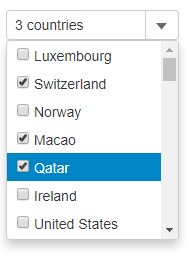 drop-down element (exposed by the dropDown property): An HTML element shown when the user presses the drop-down button or the F4 key. The user interacts with the drop-down element to update the value of the input element and of the control. The InputColor control is a drop-down that allows you to type a color using the HTML color specification or select one from a ColorPicker dropdown. 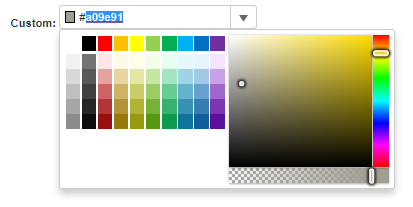 The ColorPicker control is a panel that allows users to pick colors. 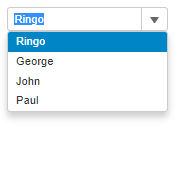 It is used as a drop-down by the InputColor control. 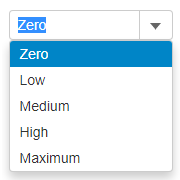 Users cannot enter non-numeric values at all. 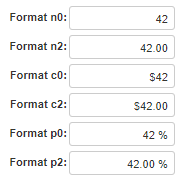 You can use the format property to format the number as it is edited, making it easy to read. You can use the min and max properties to specify the valid range of values (users will not be able to enter values outside this range). You can use the step property to specify an increment that is added to the value when the user clicks the increment/decrement buttons on the control. 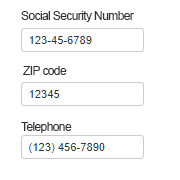 The InputMask control allows you to validate and format user input as it is entered, preventing invalid data. Display a list of items that contain plain text or HTML, and allow users to select items with the mouse or keyboard. ListBox supports multiple selection and item templates, as well as string arrays or arrays of objects for the itemsSource. MultiSelect: This is a drop-down control that extends ComboBox and adds checkboxes next to each item in the drop-down list. Currently checked items are exposed through the checkedItems property. MultiAutoComplete: This is a drop-down control that extends AutoComplete so selected items are shown as 'tokens' next to the control header, where they can be removed with the mouse or keyboard. Currently selected items are exposed through the selectedItems property. ListBox: The ListBox control has a checkedMemberPath property that allows you to add checkboxes to items on the list. It has a checkedItems property that gets or sets the list of checked items.